Tromsø lies in Northern Norway. The 2,521-square-kilometre (973 sq mi) municipality is the 18th largest by area out of the 422 municipalities in Norway. 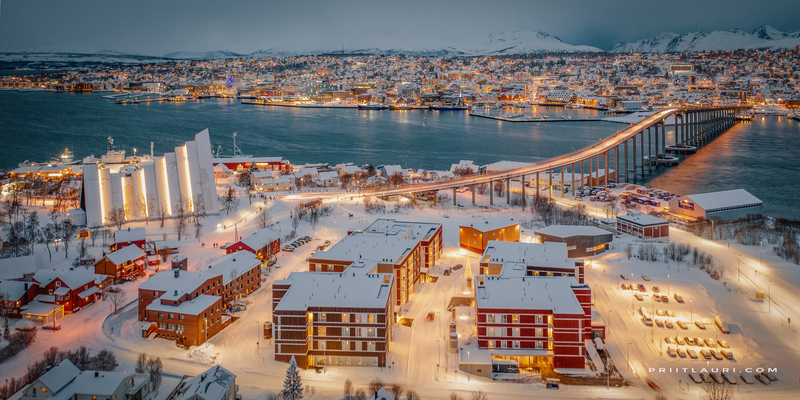 Tromsø is the 9th most populous municipality in Norway with a population of 75,638. The municipality’s population density is 30.6 inhabitants per square kilometre (79/sq mi) and its population has increased by 15.9% over the last decade. It is the largest urban area in Northern Norway and the third largest north of the Arctic Circle anywhere in the world (following Murmansk and Norilsk). Most of Tromsø, including the city centre, is located on the island of Tromsøya, 350 kilometres (217 mi) north of the Arctic Circle. In 2017, the city of Tromsø had a population of about 65,000 people spread out over Tromsøya and parts of Kvaløya and the mainland. Tromsøya is connected to the mainland by the Tromsø Bridge and the Tromsøysund Tunnel, and to the island of Kvaløya by the Sandnessund Bridge.